Happy New Year my Lovelies!!!!!! Hope all your wishes come true this year. I hope i am not too late to wish you. Hope you enjoyed New Year's Eve a lot. Holiday season is over and I am back to regular posting now. I actually wanted to post this on 1st Jan but because of hangover some reasons i couldn't. Glitzology is relatively new indie brand and has brilliant collection. Stacy, the owner and creator of these beautiful polishes launched Glitzology with really huge collection and i was amazed to see her glitter creations. She sent me 6 polishes to swatch. As each polish she sent is mind blowing i decided to swatch them in parts. So, today i am showing u pretty girls Skeleton Key and Island of Misfit Toys. First Skeleton Key. The polish as Stacy says "is inspired by one of my favorite movie characters, Lydia from Beetlejuice. As an angsty little goth girl in the 90's, I could totally relate to her! " Its a clear base polish with lots of big and medium hex, square, shreds and bar glitters of purple, matte black and white. 2 coats of Skeleton Key over Models own Aciid with top coat. I like the combination of purple with black. Polish can be wear on its own and the formula is ok. I guess dabbing would be nicer approach to wear this polish as its looking bumpy because of swiping. Next is Island of Misfit Toys. This polish is part of Bad Santa Holiday Collection but still available on her store. This polish has silver shimmery base with lots of bright hex and squares of blue, green, yellow and red in different sizes. I layered 2 coats of Island of Misfit Toys over barry n bright pink topped with sally hansen insta dry anti chip top coat. Formula is good and application is nice. All the Glitzology polishes are 3 free and one thing i liked most about her polishes is, i got 6 polishes and each one of them have tons of glitters and not a single polish require fishing for glitters. 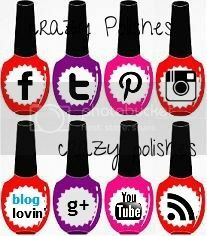 Her polishes costs $8.50 and international shipping is very reasonable, just $6. Currently she is offering a discount of 40% on orders. You can see the entire range on her Etsy Shop and can also contact her on her Facebook Page. Please share which one you liked most. Have a prosperous new year !! !